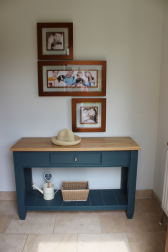 Whether you require a stand alone piece of hand painted furniture to compliment your home or a totally bespoke one-off piece, each project will be crafted using traditional methods, using only the highest quality materials and fittings. Any awkward spaces or alcoves within your home can be enhanced with a made to measure storage unit, bookcase, wardrobe. Toy box for Xmas enhanced with your child's name or a blanket box for the end of the bed. The options are endless. As each piece is made with solid wood it will stand the test of time and enhance your home for a lifetime. The beauty of hand painted is the flexibility to change the colour should the mood take you. 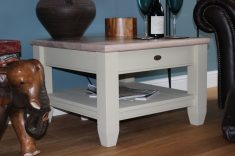 We have examples of some stand alone pieces in stock that we have previously made to enable you to see the quality of the craftmanship and materials used. We also have lots of literature and access to sources of information to assist you with ideas and options to 'build' your own unique piece of furniture. Sizes can be adjusted to suit your environment. 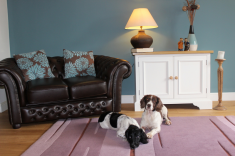 Colour and finish of your choice - all Farrow and Ball paint. Huge range of quality handles and fittings to add the finishing touches. For example - the Console unit as shown - has potentially a mulitude of uses and functions. Looks stylish in a hallway. Functional in a kitchen. Put a ceramic bowl on top and you have a contemporary vanity unit for a bathroom or cloakroom. This example is finished with an Oak worktop - but maybe you'd like it finished with Granite? or Corian? for a wipe clean finish. Please contact us for further details or to arrange an appointment.